Built as a tug by the Italian yard Benetti in 1964, Vervece completed a total refit in 2013 at the Palumbo yard in Italy, bringing her up to luxury yacht standards. Under her owner’s supervision, the interior now has a cool, calm ‘beach house’ contemporary style. One more unique Yacht for Sale! The main salon is a large and beautiful space, flooded with light via large windows, sweeping views. A split layout sees a full formal dining area next to casual seating and an entertainment set up aft. A well-positioned light and modern galley is accessed directly off the dining area, allowing for ease of service. With good natural flow between all onboard spaces the main deck stairs lead downwards to some guest accommodation and up to the bridge. Also on the upper deck, leading back from the bridge, is second communal salon with casual lounge seating, a desk and coffee table, that leads outside to another deck space with further outdoor seating. Powered by twin Cummins KTA 1000hp engines Vervece cruises at 10 knots, with a maximum speed of 14.5 knots. Advanced navigation and communication systems ensure coverage in even the most remote areas. 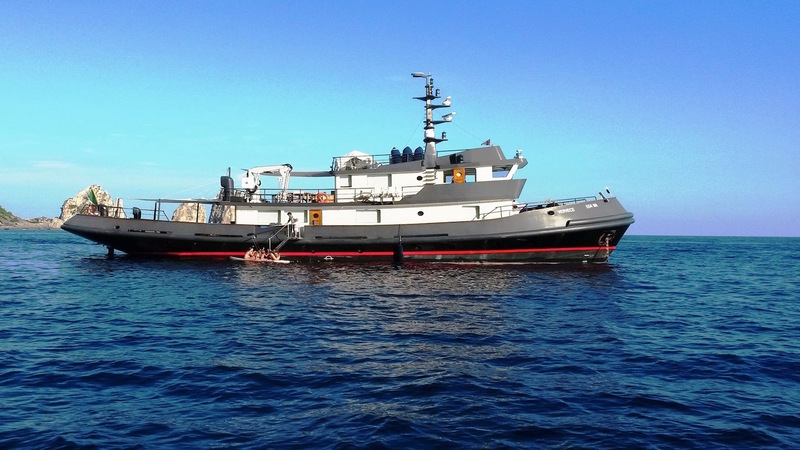 With good storage on board she carries watercraft including 4.5m and 4m LOMAC tenders.